Selected as one of NPR's Best Books of 2016, this book offers superior learning tools for teachers and students, from A to Z. An explosive growth in research on how people learn has revealed many ways to improve teaching and catalyze learning at all ages. The purpose of this book is to present this new science of learning so that educators can creatively translate the science into exceptional practice. The book is highly appropriate for the preparation and professional development of teachers and college faculty, but also parents, trainers, instructional designers, psychology students, and simply curious folks interested in improving their own learning. Based on a popular Stanford University course, The ABCs of How We Learn uses a novel format that is suitable as both a textbook and a popular read. 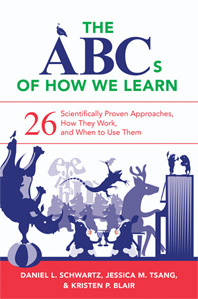 With everyday language, engaging examples, a sense of humor, and solid evidence, it describes 26 unique ways that students learn. Each chapter offers a concise and approachable breakdown of one way people learn, how it works, how we know it works, how and when to use it, and what mistakes to avoid. The book presents learning research in a way that educators can creatively translate into exceptional lessons and classroom practice. The book covers field-defining learning theories ranging from behaviorism (R is for Reward) to cognitive psychology (S is for Self-Explanation) to social psychology (O is for Observation). The chapters also introduce lesser-known theories exceptionally relevant to practice, such as arousal theory (X is for eXcitement). Together the theories, evidence, and strategies from each chapter can be combined endlessly to create original and effective learning plans and the means to know if they succeed.